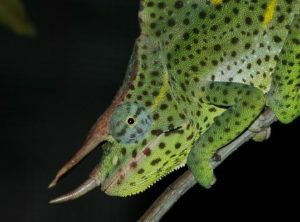 We have a small group of Usambara Giant Three Horned Chameleons for sale. Deremensis Chameleons are one of my favorite chameleon species. This is a chameleon we’ve worked with for several years. As babies Deremensis Chameleons come out bright blue with white and yellow and dots covering their bodies. They are a very slow paced chameleon and their skin reminds me of a Parsons Chameleon (Velvet like). They are the most wide bodied of the 3 horned chameleon species. Deremensis chameleons are a montane chameleon that prefers temperatures in the low to mid 70’s as a daytime high. They typically require cooler temperatures and plenty of hydration due to the frequent dew and rainfall in the regions they are native to. They have very similar requirements to that of a Jacksons Chameleon. 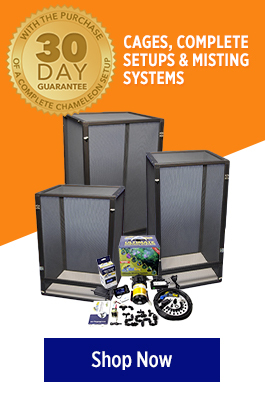 Read our Jackson Chameleon Basics sheet for detailed information.